The St. Louis Rams are a team that is on the rise, but yet again, another team that is in the wrong division where they can’t get the respect they deserve. 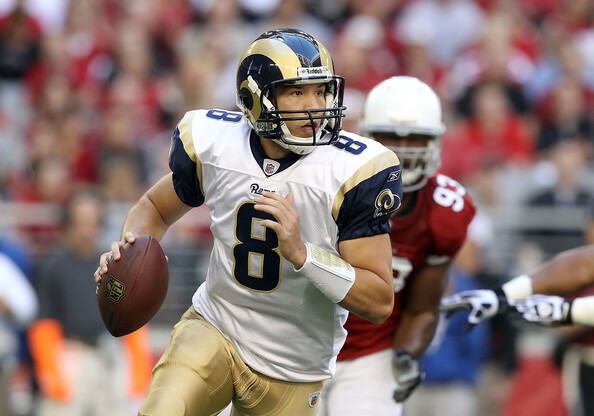 Sam Bradford of the St. Louis Rams will be leaned upon to take the team to new levels. Unfortunately, the Rams don’t have the offensive playmakers that can compete with the other 3 teams in their own division – the NFC West. The Rams are a team that has a great defense, not quite elite yet – could get there this year, but their offense has many questions. Quarterback Sam Bradford should be healthy & ready to go this season, but the question is who is going to step up & be a playmaker outside of Tavon Austin, who is in his second year from West Virginia? The team doesn’t have a set starter at running back who is good enough to replace Stephen Jackson, who signed with the Atlanta Falcons last offseason. Young WR Chris Givens will be looked at to make some kind of impact this year, which if he can’t, the team has Kenny Britt on the roster, who signed over from the Tennessee Titans. In terms of protection, the team signed left tackle Jake Long from the Miami Dolphins, one of the best LTs in the entire league. From the defensive side, the Rams have a great pass rush from Robert Quinn & Chris Long, great linebacker play from James Laurinatis, & a true lockdown cornerback from Janoris Jenkins. However, the mystery of the offense & not having enough playmakers that can handle the rest of the teams in their own division will be what keeps the Rams at the bottom of the NFC West. This is a 6-10 team, but a team that will be a very tough & physical 6-10 team that will be better most weeks than teams that are outside of the NFC West.